I came across two neat tidbits today from the fiber world to share. First, my talented friend Shirley sent a link to the wearable art show in Juneau, Altered States. Many of the pieces in the show used reclaimed materials prominently in the garment. The gallery of photographer Seanna O’Sullivan showcases the event on the runway and backstage as the models are prepped for their appearance. 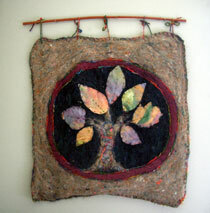 The International Fiber Collaborative is working on building a tree as a way to illustrate the idea of interdependence. “Much like a live tree is interdependent on its leaves and roots for survival, societies are interdependent on the greater whole, family units, communities, and countries. Participants from around the world are invited to create leaves to contribute to the creation of the tree. ” The submission deadline to have your leaves added to the tree is March 15th. Leaves must be created using fiber, but beyond that, use your imagination. Make sure to look through the gallery to see the submissions they have received so far. For several years, I’ve wanted to try making silk paper in an effort to reproduce the embossed leaves from this piece by Emily Archer of Milkweed Arts. I found some instructions on Pat Sparks’ website, but I’d love to hear whether anyone has worked through this process. My son wants me to coordinate a project for his K-1 art class, and I’d love to dovetail the two projects. Am I biting off more than I can chew and swallow? 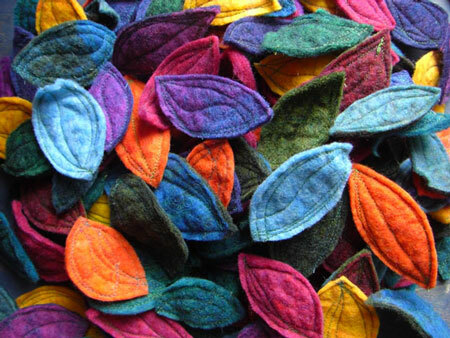 If I can’t carve the time out in the next two weeks, I have a box full of these felt leaves to send. This entry was posted in inspiration, kids' art, recipes by Leah. Bookmark the permalink. wow! so many links to click on!! I have never worked with silkpaper but have been very interested on it. I’ve been busy with other things lately and haven’t had the time to do the proper research. It does look wonderful. Do please share your thoughts on this, maybe we can all learn together! I love the picture of the leaves, just beautiful! 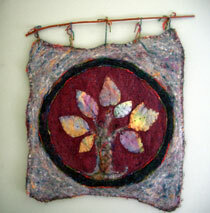 There is an fibre artist – Joanne B Kaar. She has a book you can buy very cheaply through amazon. I was taught to make silk paper by her and it is glorious. I teach it to children who love it more than even I do. I often combine the silk paper with felt. I replace the cellulose for corn starch which washes away better than the glue. You just have to try it……………. I am addicted to dyeing the silk tops myself. Oh the joy of the colours and shimmer.